I don’t believe him. Not for a moment! 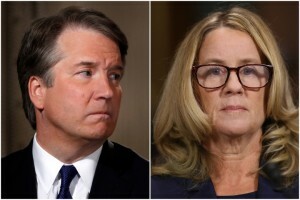 I spent much of yesterday afternoon, evening and night watching the Kavanagh hearings on CNN. I’d say I’m mad as hell, but the truth is it’s useless to feel that way. I no longer believe in the process of justice – so what’s the point of being angry? I’m resigned and fed up. But somewhere in the bottom of my soul there is a shred of feeling that justice will prevail. Karma will win in the end – even if the end is a long way away. Am I wrong? I remember so well the hearings of Anita Hill versus Clarence Thomas. I believed every word she said, and none of what he said. But little did that help her, or us. The nation gained another conservative judge on the Supreme Court and we Americans took a step backwards in progress and equality. Never mind what it did to Anita Hill. Dr. Christine Blasey Ford was, in my opinion, respectful, honest and in pain while she described the sexual assault from so many years ago. I think it was so obvious that she was telling the whole truth and nothing but the truth. While the Republicans felt the need to hire a hot shot special prosecutor to question the witness, Dr. Ford maintained her cool as well as a sweet, reticent demeanor. Not so Judge Kavanaugh. I know a bit about angry men. My father had a vicious temper as did both my husbands (I’m not a Mormon, I divorced the first and then married and divorced again). When they were angry (and it was often) they were VERY angry. I soon found out that when they were guilty about something their indignant stance became outrageous. The more the guilt, the more the belligerence. Calming down, offering an apology, taking a step back was never an option. I heard the phrase might makes right a little too often. I thought we were done with fighting for women’s rights in the 70’s. Apparently I’m wrong. Women are no more respected now then they were then. And why should they be respected when we have a President sitting in the White House who has repeatedly said disgusting things about women and anyone he disagrees with? We’ve entered into a very dangerous and troubling time, and the Republican Party seems to be pulling up the rear with their blind following of the President and the entire Conservative movement. I’m scared about where this is taking us. Judge Kavanaugh started his tirade blaming the Democrats for this “witch hunt.” And as I mentioned, he had the audacity to bring up the Clintons (he worked with Kenneth Starr in the impeachment proceedings against Bill Clinton). Can we really consider him to be a fair and impartial judge sitting on the Supreme Court? When he blames the entire Democrat party for the chutzpah of objecting to his selection, will he really be able to set aside his personal feelings and handle each decision he is asked to make fairly and judiciously? I think not. I find this so terribly troubling. I know there must be some good, thoughtful caring men out there who are horrified by what is going on. I just wish I could hear a few of them speak up. And Republicans? Aren’t there any mensches among them – one or two who have more integrity than party allegiance? I hope this train can stop in time before it crashes full speed into a brick wall.